Next week, January 19 to 21, President Obama will host Chinese President Hu Jintao for their first bilateral summit this side of the Pacific. According to former National Security Adviser Zbigniew Brzezinski, this “will be the most important top-level United States-Chinese encounter since Deng Xiaoping’s historic trip more than 30 years ago.” While economic and military issues will be on the agenda, a key part of the meeting will be energy. U.S. Secretary of Energy Steven Chu has suggested that a Sputnik-like race for clean energy between China and the U.S. may be emerging. If so, how can the U.S. get in the game, given the current political climate in the country? The original UNFCCC charter from 1992 stipulates that developed nations, such as the US, lead the world in fighting climate change, since they bear historical responsibility for producing it. The 1997 Kyoto Protocol echoes and expands this concept, calling on countries to act with “common but differentiated responsibilities,” which means while all nations are “responsible,” each nation acts according to its ability based on its level of development. From recent UN negotiations in both Copenhagen and Cancún, it is clear that the U.S. wants an agreement that has “symmetry” — one that includes reductions commitments from developed and developing countries. China, for its part, is willing to make voluntary commitments but insists that the U.S. sign on to a legally binding agreement. Yet whether this new clean technology race pits the U.S. against China competitively, as the Cold War-era space race did, or allows for scientific partnerships between the U.S. and China remains an open question. The new joint U.S.-China Clean Energy Research Center (CERC), which will be featured at next week’s meeting, forms one sign of collaboration. The center will facilitate joint research and development on clean energy. Priority topics include building efficiency, clean coal, carbon capture and storage, and clean vehicles. Despite this sign of cooperation, the U.S. and China have exhibited remarkably different approaches to the development of clean technology and how to transition from a fossil fuel-based economy to one predominantly reliant on renewable energy. Although historically China has relied on coal and hydropower for its electricity, it is investing in renewable energy at breakneck speed. Currently, 70 percent of China’s economy is coal-powered. But policy changes are afoot. Although it is not an official figure yet, China’s energy bureaucrats seek to drop coal reliance from 69 to 63 percent by 2015. According to Zhang Guobao, Director of China’s National Energy Administration, China has saved more than 300 million tons of coal in the past five years by replacing dirty and outdated thermal power plants. Another new policy puts forth that 15 percent of China’s energy must be derived from renewable energy. In addition, China’s new energy policies focus on energy efficiency compliance, considered a green technology in China. Overall, China is the world’s biggest manufacturer of solar panels. Suntech Power in Wuxi is the world’s third largest producer of solar power. Moreover, while China produced 50 percent of the world’s solar panels in 2010 it receives about 2 percent of its total energy from solar. Under new aggressive government plans for investment in renewable energy, however, this number will likely grow rapidly. In Rizhao, a city in northern China, 99 percent of households use solar water heaters. Recently, an Arizona-based company, First Solar Inc. signed a deal with China Guangdong Nuclear Solar Energy Development Co., a Chinese state-owned energy company to build one of the world’s largest solar power facilities in Inner Mongolia. 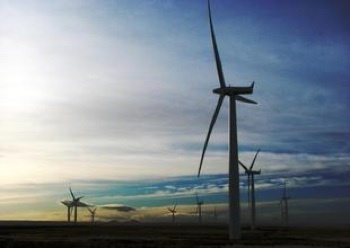 Challenges to China’s wind economy remain. According to Li Yan, “If one talks about the installation capacity, China will probably be number one by the end of this year or next year, but if we talk about wind energy that has been connected, then we are still far behind.” While installation occurs more quickly, connecting, according to Li Yan, remains slowed by the centralized state owned energy structure, which has created a bottleneck. Li Yan’s concern pinpoints one of the potential pitfalls of the China’s implementation strategies: strong policies at the central level do not always translate well into solid implementation at the regional level. In March, China will release the 12th Five Year Plan (2011-2015), which will set new renewable energy targets. The plan calls for deep cuts in energy-intensity and large subsidies to bring renewable energy and electric vehicles to scale. It includes both a cap and trade program and carbon taxes. And it requires utilities companies meet energy-saving targets and invest electricity revenues in renewable energy. Additionally, China has announced that it will produce a nation-wide greenhouse gas inventory by 2012 — its first since 1994. Producing such an inventory of greenhouse gases requires a sophisticated ability to measure emissions from a variety of sources. While implementation remains a challenge, many of these targets are being met. For example, China’s National Development and Reform Commission recently announced that it will meet its target of reducing total pollution by 10 percent from 2005 to 2010. Last year, the Chinese government ordered blackouts in many parts of China in order to meet another target to reduce energy intensity by 20 percent by 2010 from 2005 levels. Thus in China, a race toward self-reliance and clean energy technology is certainly on, even if it the Sputnik Moment race itself is a U.S. construct. Chu, like China, seems to be taking the long view of the environmental and economic situation. In the U.S., renewable energy still needs to be made cost competitive. A number of measures could help to develop and make renewable energy affordable: 1) feed-in-tariffs; 2) subsidies; 3) tax credits; and 4) state regulations provide renewable portfolio standards (RPS), that is, demand that a specific percentage of their energy, typically 4-30 percent, be derived from renewable energy sources by a specific date. A feed-in-tariff system — the first of these incentives — allows homeowners, who have installed solar panels, to sell back to their utility company the excess amount of energy produced, thereby reducing their overall electric bill. As of 2009, 11 states were considering legislation to permit feed-in-tariffs in the U.S.
Subsidies in the United States often heavily favor fossil fuels. This predilection leaves renewable energy, which has been growing nonetheless, artificially gummed up in the U.S. Subsidies for renewable energy could encourage a shift in the base. Tax credits for production of renewable energy are also extremely beneficial. Thus far, growth in wind farms has been astronomical as a result of the Recovery Act or tax credit 1603. Michigan is second nationwide for wind manufacturing and just announced another new plant. Its success comes as a direct result of grants from the U.S. Department of Energy. Additionally, Recovery Act funds help businesses diversify into clean energy through the Clean Energy Advanced Manufacturing program. And a state law enacted by Governor Jennifer Granholm in 2008 requires 10 percent of the state’s energy to come from renewable sources by 2015. Due to these subsidies and laws, the U.S. Department of Energy projects that Michigan will create 30,000 more jobs in the wind-manufacturing sector. The results of all this investment into wind in the U.S. are already upon us. Texas, Iowa and California lead the country in installed wind capacity. To date, 20 percent of all energy in Iowa comes from wind; it marks the largest growth over the past year. In Texas, 25 percent of all energy comes from wind power. Wind farms in the Southwest and off the coast in the Atlantic have also ramped renewable energy sources. Across the country, wind as a source of renewable energy has increased four-fold over the past decade. It remains to be seen what results Chu’s ramped-up program will have for the economy and the environment. Given last week’s changes in the Obama administration and at the helm of the House, will the Department of Energy be able to ring in a new era committed to clean technology and renewable energy? Will it be able to be competitive in a renewable energy race? In light of Hu Jintao’s visit to Washington, the Sputnik Moment proclaimed by Chu could herald either a new era of cooperation, or of competition. Tina Gerhardt is an academic and journalist whose writing has appeared in Grist, The Huffington Post, In These Times and The Nation. Lucia Green-Weiskel is Project Manager of the Climate Change Program at the Beijing-based independent Innovation Center for Energy and Transportation (ICET). Her work has appeared in Chinadialogue.net, Grist and The Nation. This article was originally published on AlterNet.org.